Michelle Sanderson may appear to be a strong, independent woman, but on the inside, she's still the wounded girl who fled home years ago. A young army vet, Michelle returns to the quaint Blackberry Island Inn to claim her inheritance and recover from the perils of war. Instead, she finds the owner's suite occupied by the last person she wants to see. Carly Williams and Michelle were once inseparable, until a shocking betrayal destroyed their friendship. And now Carly is implicated in the financial disaster lurking behind the inn's cheerful veneer. To save their livelihoods, Carly and Michelle will undertake a turbulent truce. It'll take more than a successful season to move beyond their devastating past, but with a little luck and a beautiful summer, they may just rediscover the friendship of a lifetime. That's what this book is about and it was a really fantastic read. But there is a long road in this book to the happy ending and a lot of it is filled with very real issues for both Carly and Michelle, but especially for Michelle. She's just come back from war, wounded both inside and out, and she is sinking fast. 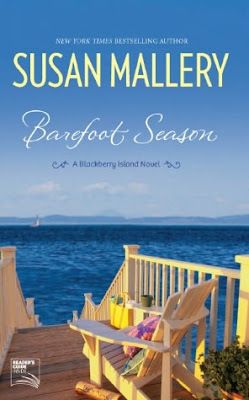 This entire book takes place in the quaint little tourist destination of Blackberry Island. The inn where Michelle grew up is here and now she owns it. She's come back to take over after being gone for 10 years. Standing in her way is her former best friend, Carly. Michelle fled Blackberry Island when she slept with Carly's fiance 2 days before their wedding and they've never spoken since. But as you could guess, there is MUCH MORE to both sides of their story than this. There are two main characters in this book...Carly and Michelle. Both of them have learned to be strong and self-reliant the hard way. Once upon a time, they were there for each other, but then one of those hard-knocks of life ripped their friendship to shreds and neither one of them have truly recovered in the ten years since. Michelle has spent that ten years at war as a soldier and she has the scars to prove it. Carly spent those ten years as a single mother under the dominated, manipulative hand of Michelle's mother. When they find out that they have to work together, neither one of them is happy, but they are in a situation that neither of them can control. This is a book about healing. Michelle has a physical and mental healing that needs to happen. Carly needs some mental healing too. Both of them need relationship healing and over the course of the summer, you get to share that with them through this book. There are so many poignant, moving scenes in this book as well as minor romance story lines for the both girls. The scene when the dog comes on the scene with Michelle...bawling! Such an amazing scene. This is a book that makes you feel good to read it. It's certainly not all rainbows and daisies...although there are a LOT of daisies in the book. But it's real. It's about real emotions and real feelings and real life situations....set in a fictional book. ;o) I really enjoyed it. It would make a fabulous summer vacation read. Thank you so much for the wonderful review, Christi! (And thank you, Felicia, too!) I'm thrilled that you enjoyed BAREFOOT SEASON. I appreciate everything you do to tell other readers about the books you love. If you liked so much this book,I think you should read How to Eat a Cupacke. Is about friendship and mostly on two friends trying to work on their relationship. Loved your review and already have him on my TBR.